“Bull’s Eye Tolerance”. King engine bearings have the closest wall tolerances in the industry, with all shells matched to 0.0001". Successful race engine builders are constantly pushing the limits of load capacity to new levels. Race bearings today inevitably need to match these demands with more competitive bearings. - “Bull’s Eye Tolerance”. 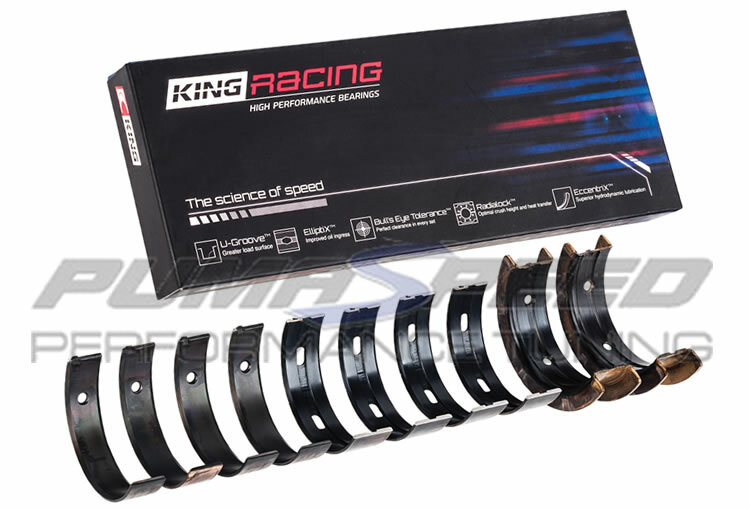 King engine bearings have the closest wall tolerances in the industry, with all shells matched to 0.0001". - Increased Height. Greater rod bearing height improves bearing-to-bore contact/heat transfer and reduces spin potential at high RPM. - Improved Oiling. Mains feature enlarged, chamfered oil holes. - Medium Eccentricity. This enables optimum load distribution and improved oiling. - Dowel Holes. Most rod bearings are available with or without dowel holes. - Narrowed Design. Mains and rods are narrowed for large-radius crankshafts. Pumaspeed have a specialist distribution team that can dispatch the 2.0 and 2.3 Ecoboost King Racing Main Bearings to any destination worldwide.